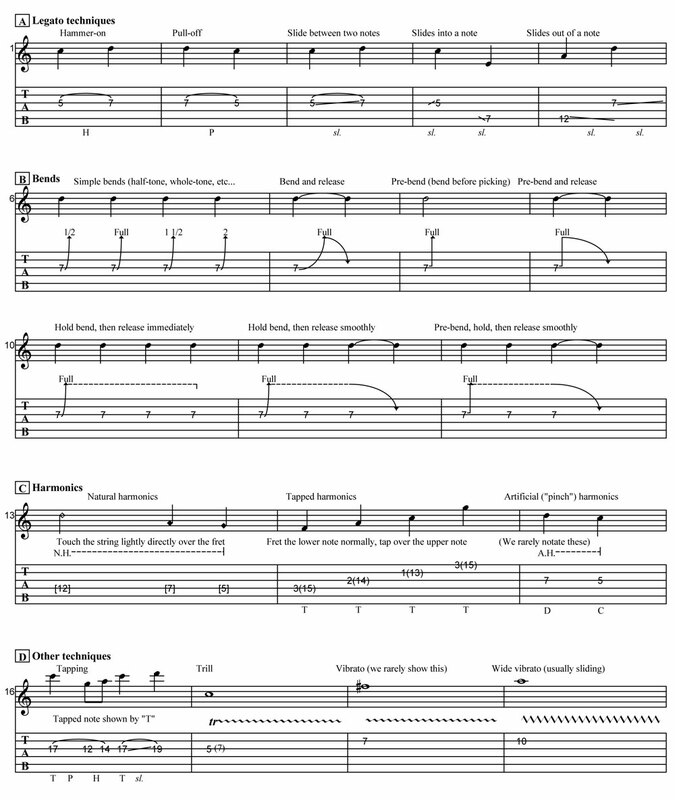 All of our Tab transcriptions and lesson notes are in PDF format. This universal format can be viewed in Acrobat Reader (Mac/PC/Linux) or Preview (Mac only). Most of our Tabs are also in Powertab (.ptb) format. The Powertab Editor program (www.harmony-central.com/Software/Windows/powertab.html) is only available for Windows, but it has a MIDI playback facility so you can play the notes (with a synthesizer sound) and you can adjust the tempo for more effective practising. Mac users can open the Powertab files adequately with Tuxguitar (http://tuxguitar.herac.com.ar/. If you prefer to use Guitar Pro (on PC or Mac) this program can very easily import Powertab files into .gp5 format. We hope you've been enjoying the new debut package by the mysterious guitar guru known as The Oracle (check it out here)! You might have noticed that a couple of the tracks are specifically about dominant and altered dominant chords. There wasn't space for a lot of detail in the PDF included with the package, so we thought we'd tell you a bit more in this free bonus lesson. We're going to show you the (musical) meaning of dominant and how an altered dominant is created. In any key, only one chord is called the dominant... the one built on the 5th note of the major scale. This is always a major triad and if you extend it, the 7th is always minor. In the key of G major, the dominant chord is D and the dominant 7th is D7. Counting from the D note (the root of the chord) that gives us a major 3rd, a perfect 5th and a minor 7th. See? They all have the F# (major 3rd) and C (minor 7th) but they gradually get more notes, always added a 3rd above the previous one, always sticking to notes from the scale (that's what diatonic means). All those chords are described as dominant chords, and if you want some cool ideas for soloing over dominant chords, check out the track Dominant Nature in the first package from The Oracle! Don't worry... if you understood the stuff about standard dominant chords, this bit is easy! It's standard practice to leave out the 5th in dominant chords (especially on guitar, when you have limited fingers and strings). However, if the 5th is altered, it MUST be included. Altered chords can also include all the other dominant extensions and more than one altered note, so you could have D13b9 or D7#5#9... beautiful complex jazz chords. In the first Oracle package, the lesson Altered Reality shows how the Superlocrian scale can be used to solo over altered dominant chords. Trust us, it sounds great! Last week we released the incredible new 10 track Vintage Blues series by Paul Harvey. Here, Paul breaks down each track to help you get the best out of learning to play the solos in this series, as well as approaching your own improvisations. Cloud Bathing - Melody is king in this melodic Fleetwood Mac inspired tune. The ethereal atmosphere and percussive elements create the perfect backdrop for the memorable top line.This is a great tune to improve your vibrato and general expression in your playing. The Conjurer - Another Fleetwood Mac inspired tune with a mid tempo rhythm and almost "latin" feel. The beginning of the track will make you focus on the melodic and as the tempo increases, the upbeat backing will allow you to make your notes sing over the top of the ascending sequence. Axis - A classic blues progression with a mid tempo shuffle feel. By using controlled blues licks and note bending at the start of the tune, you can gradually build your solo using higher octaves to reach a crescendo. Then by returning to the melodic licks, you can achieve more dynamics in your playing. Crossing the River - A Blues Gospel style ballad which is so cool to play over. Leaving space between your licks is so effective here. Those gaps between phrases can seriously enable you to confidently build the solo.You are quite literally taking the role of the vocalist and by employing these techniques you will make the melody strong and expressive. Speedway Blues - This has an uptempo bouncy groove where the solo guitar can really dig in. Think power trio, where the bass and drums are holding down a solid groove urging you to let loose and burn! Over the Wall - A confident sounding backing track which puts you the soloist firmly in control. Paul Kossoff style licks work so well over this solid groove. Fault Line - I've used that famous 'Out of Phase' Strat sound on this swinging blues progression. This sound will give you a glassy and dynamic tone which is so expressive in these type of arrangements. Melodies are easily achievable here by simply using the trusty old pentatonic scale. Party Animal - Riff driven 'US Cop Show' style blues in C sharp minor. The feel is more open here which encourages a rhythmic approach to soloing and will help you develop your note bending skills. Hustler - Modern lazy blues shuffle in G major. Grown up confident licks work so well over this sophisticated groove. Steam Driven - Delta style blues with a twist. A combination of minor and major sections give light and shade making effective use of the pentatonic scales employed. Dave Lockwood's Smooth Grooves series has been a wonderfully well received set of jam tracks. To help your quest to get the right sound for these early Larry Carlton sounding jam tracks, here is a breakdown of exactly what gear Dave used for each track. All tracks are using a Fender 62 reissue Strat, except for Outside In, which is a 52 reissue Tele, and Parallax, which is a Les Paul Custom. The main amp is a Hughes & Kettner Statesman Dual 6L6, using the Drive channel always, even for the cleaner sounds. This drives a single Eminence 10" Alnico speaker in a sealed cabinet, miked with an AKG Solidtube large-diaphragm condenser. Dave monitor's reverb and delay whilst playing, but doesn't generally record it, preferring to maintain the flexibility at mixdown. The effects used on the guitar in the mix are Logic's stereo delay, and Universal Audio's Lexicon 224 plug-in. Anamorphic  Strat, middle and neck pickup combination; AnalogMan compressor pedal; H&K amp; sealed cab. Discoteca Potenza  Strat, bridge pickup; SansAmp Classic pedal DIed, using the Hot-rodded Marshall setting from the manual (I was reviewing it for SOS at the time and rather liked it). Figueroa  Strat, bridge pickup; Fulltone OCD pedal in Hipass (Marshall) mode; H&K amp, sealed cab. Gone So Long  Strat, bridge pickup; Fulltone OCD pedal in Hipass (Marshall) mode; H&K amp, sealed cab. Hot Wired  Strat, bridge pickup; SansAmp Classic pedal DIed. Make It So  Strat, bridge pickup; Fulltone OCD pedal in Hipass (Marshall) mode; H&K amp, sealed cab. Outside In  Tele, bridge pickup; H&K amp, sealed cab. Parallax  Les Paul, neck pickup (A part), bridge pickup (B part); H&K amp, sealed cab. Snake Oil  Strat, bridge and middle pickup combination; H&K amp, sealed cab. Some Time Soon  Strat, neck pickup; AnalogMan compressor pedal; H&K amp; sealed cab. Smooth Grooves is available for £14.99. The Jazzy Jams series has been created by Alex specifically to help you improve your Jazz by improvising over some of the most popular chord progressions played by millions of musicians around the world. The following is a guide to which famous tunes the Jazzy Jams series are based upon. This series is also progressive, so if youre new to chord changes then Night train to Chicago and Series 1 is where you should start and then work your way up to series 3. If you are a more experienced player then choose any (or all!) of Alex's Jazzy Jams Series and learn Alexs Solos as well as trying out your own ideas. Alex Hutchings' Jazzy Jams Series 1-3 are available NOW!